What? What can I say? I like it! I also like terrible puns, so…. I had been dreaming of a Halloween-themed quilt ever since I saw Amanda’s gorgeous Swoon last year. When Lizzy House came out with her Guising line, I knew I had to make something with it. Because it’s so adorable, and Lizzy is awesome. As soon as I got my hands on it, I started stripping and sewing, and lo! I whipped up this top, which I kinda wish I had made one set of columns wider. As it stands, it’s a great size for a throw, perfect for crisp Autumn evenings. I’ll be at gather here in a little bit, teaching folks how to make this, and I am so eager to see what people come up with. It’s such an easy-peasy design and lends itself so well to a plethora of fabric selections. There’s just no going wrong with it! Gorgeous! Who does a girl have to throw money at to get your pattern/guidelines??? heh, as you should! i love everything about this quilt. I really want to make something from that ghost fabric, but it would be the most perfect ghost fabric if the ghosts glowed in the dark! 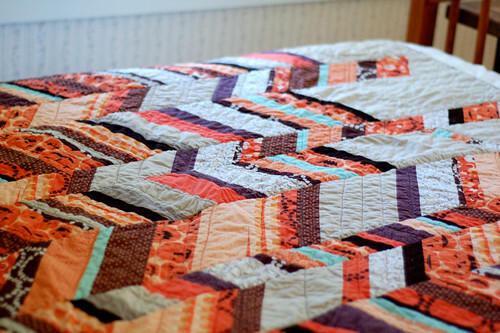 Do you have a tutorial or pattern for this quilt? I LOVE it!!!! AMAAAAZING!!!! Did you write a pattern up for it? I would love to make this for my mom.